Michelangelo was born this date in 1475. 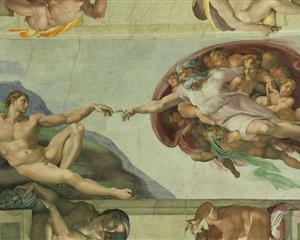 If you’d like to read more about the Sistine Chapel ceiling you can start at The Michelangelo Gallery. And after you’ve looked and read some, imagine the Sistine Chapel– or any of Michelangelo’s or Da Vinci’s or thousands of others’ works– gone. Yes. Brings a tear to the eye. And four years working… on his back. A-R. Funny stuff. Did you take those DVDs with you or are they here somewhere?